Co-founder of H4P, Isber Sabrine, is profiled by Sally McGrane here, in an article that highlights the true importance of heritage to the Syrian people. Isber also attended the network meeting of the Young Experts Forum “Unite for Syrian Heritage”, from Friday 23-September – Sunday 25 September, supported by UNESCO and Gerda Henkel Stiftung. The event was very successful with outputs to follow. Aleppo’s ruined covered market. Photo copyright: newsthrive.com. 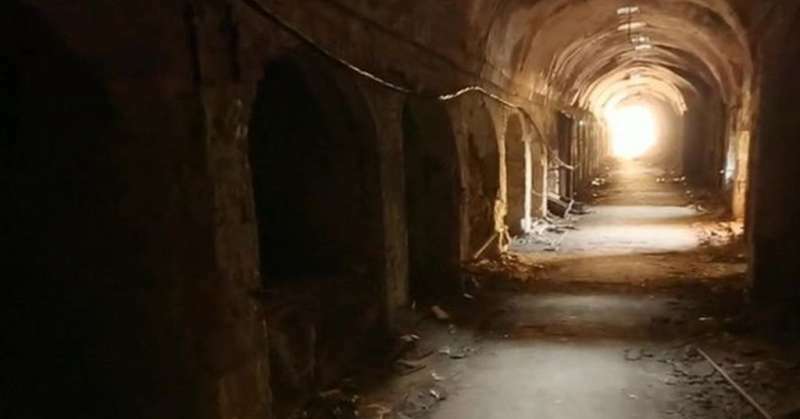 The BBC goes inside Aleppo’s ruined covered market. 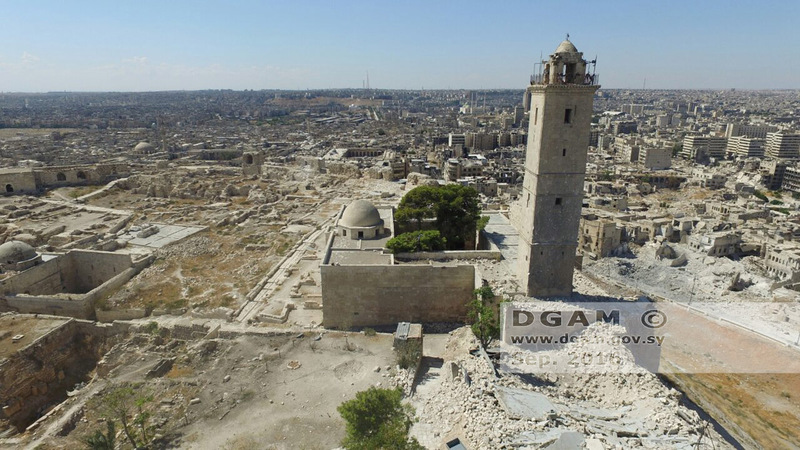 The DGAM publishes drone footage of the Aleppo Citadel on September 16th. ASOR CHI release weekly report 105/6 August 3-18. US-led coalition airstrikes have destroyed or damaged many buildings on the Mosul University campus, some of which were reportedly being used by ISIL militants (ASOR CHI Incident Report IHI 16-0026). ISIL militants reportedly destroyed a 10th-century CE Syrian Orthodox Church in Mosul, Ninawa Governorate in order to expand a nearby mosque (ASOR CHI Incident Report IHI 16-0027). New video footage shows damage to a mosque in Hreitan, Aleppo Governorate, reportedly the result of a SARG airstrike earlier in 2016 (ASOR CHI Incident Report SHI 16-0120). Video footage shows the current status of a historic bath complex and mosque in Manbij, Aleppo Governorate following the expulsion of ISIL militants from the city (ASOR CHI Incident Report SHI 16-0121). Video footage shows mortar fire striking the minarets of two mosques in Daraya, Rif Dimashq Governorate (ASOR CHI Incident Report SHI 16-0122). A SARG airstrike reportedly damaged a 12th-century CE mosque in Ma’arat al-Numan, Idlib Governorate (ASOR CHI Incident Report SHI 16-0123). SARG forces allegedly detonated explosives on the Citadel of Aleppo, damaging fortification walls and the Citadel Museum (ASOR CHI Incident Report SHI 16-0124). DGAM reports looting at several archaeological sites in the al-Hawl region of al-Hasakah Governorate (ASOR CHI Incident Report SHI 16-0125). Alleged Russian airstrike damaged a church in the city of Idlib (ASOR CHI Incident Report SHI 16-0126). A SARG airstrike allegedly damaged a mosque in Teir Ma’ala, Homs Governorate (ASOR CHI Incident Report SHI 16-0127). Reported SARG airstrikes damaged two mosques in the city of Idlib (ASOR CHI Incident Report SHI 16-0128). A Russian airstrike allegedly damaged a mosque in Anadan, Aleppo Governorate (ASOR CHI Incident Report SHI 16-0129). Video footage shows IDPs living in the ruins of Byzantine buildings in Bariqa, Quneitra Governorate (ASOR CHI Incident Report SHI 16-0130). SARG or Russian airstrikes allegedly destroyed a cultural center and a mosque in the city of Aleppo (ASOR CHI Incident Report SHI 16-0131). The impact of the war on excavations at and around Carchemish is discussed by Torchia for Associated Press. The Independent reports that many “looted” Syrian artefacts that were sold to collectors are forgeries: in fact, whilst initially only a third of seized artefacts were fake, the number now may be as high as 80%. Items from Northwest Syria were seized by French customs officials under the label “decorative panels for the garden”. The seizure is discussed in its wider context by ARCA (English) and in French here by Europe 1. Haaretz suggests that “lost” items from Syria might actually turn up at antiquities markets, although experts have questioned some of the figures. Live Science calculates the flow of artefacts into the US, although again, experts such as ARCA have questioned the figures. Apparently between 1993-2002 only $68M of artifacts were exported from Turkey to the US. Since 2003, a total of about $283 million worth of artifacts have been successfully exported. Many of these are coins, which are hard to trace and have a well established market. This week’s ‘must read’ article is definitely Eakin’s in the NY Review of books, where he highlights the extreme risks they are taking to protect their heritage. The Syrian Global Society for Preserving the Aramaic Language organised a musical event titled “Aramia 2016” in Maaloula in Damascus countryside that featured songs and poetry in Aramaic. The event also included honouring poets and Aramaic language enthusiasts from the town. Read about the festival here. Syria hopes to bring back tourists, reports Al-Monitor here. The DGAM participates in a Dutch exhibition covering the damage to Syria’s heritage. Read more about this here. New UN Report on the ways that intentional cultural heritage destruction is a violation of human rights. Read the report here. If you are interested in applying for a Saïd Foundation scholarship, and are Syrian, Lebanese, Jordanian or Palestinian and resident in Syria, Lebanon, Jordan, Palestine or Israel, and have an undergraduate degree, then you may be eligible. Find out more here. Speaking at the Metropolitan Museum of Art in New York on September 20, French President Francois Hollande announced a $100m fund for the protection of Middle Eastern cultural heritage. Read more in the Art Newspaper. The event: “Today’s Struggle to Protect and Preserve the Cultural Heritage of Religious Minorities” was a symposium co-sponsored by The Metropolitan Museum of Art and The U.S. Department of State. A variety of thought leaders from universities and cultural heritage NGOs explored ways in which the international community can assist religious minority communities in the Middle East and elsewhere in their efforts to protect and preserve their cultural heritage in the wake of aggressive and morally reprehensible attacks on their heritage by terrorists and other violent extremists. Symposium participants also addressed how attacks against cultural heritage and cultural diversity have become strategies for undermining the cohesion, morale, and viability of religious minority communities, and assess the prospects of stronger international legal remedies, such as the prosecution of the perpetrators of cultural heritage destruction. The event also included a tribute to role models in the global campaign against violent extremism: read more on UNESCOs webpage here. The Asia Society hosted an event in New York on September 16 including the Antiquities Coalition and the Middle East Institute, addressing culture under threat. The Forum brought together intergovernmental bodies, governments, law enforcement agencies, the armed forces, and business. A discussion moderated by ABC News’ Jon Williams focused on how these varied sectors can work together to combat the growing use of historical and cultural artifacts as a terrorist financing tool. The event also explored what has been learned in the past year about this illicit trade in “blood antiquities” — including the US government’s revelation that ISIS has made antiquities transactions totaling $1.25 million over just three months. UNESCO’s international conference seeks common understanding on educational measures to prevent violent extremism. Participants came together to exchange, debate and issue proposals in groups, participatory and creative way, on the question how to live together and rebuild Syria? on 23 September (here). A team of Russian scientists will travel to Syria in late 2016 to conduct a comprehensive inspection of World Heritage sites which reportedly have been destroyed by air strikes. Researchers will visit historically important sites in response to media reports of damage during bombings, with a particular focus on the Ancient Villages of Northern Syria World Heritage site. Read more here. Truth Dig reports on US lawmakers and allied interest groups meeting on September 8 to refocus their efforts on protecting ancient cultural heritage. Anonymous Swiss Collector discusses the progress of the UK’s Cultural Property (Armed Conflict) bill, which will allow ratification of the 1954 Hague Convention and both protocols. The Professionals in Humanitarian Assistance and Protection (PHAP) will be running an online course on cultural heritage protection. The course occurs on September 29th on Geneva time. ICCROM – ATHAR (UAE) will host a course between September 25/29 in Sharjah on risk assessment and contingencies for museums. More details can be found here. Italian teens will get government vouchers to cultural sites in the hopes it will help keep them from becoming extremists. Read more about this at The Denver Channel. The White House releases new Cultural Property Advisory Committee appointments. A Congressional Briefing was conducted on the destruction of cultural heritage with an all women panel. The Curious Travellers project will use digital images to build computerised 3D-reconstructions of damaged buildings and statues to aid reconstruction and remembrance of important cultural sites. They will also scan older, analogue photographs to amass the largest amount of data possible. Read more in The National. The Observer reports on September 19 that the replica of Palmyra’s destroyed arch has now been erected in New York’s City Hall Park. The issues raised are discussed in Forbes. Ban Ki-moon looks at how protecting cultural heritage from combatants promotes human rights and universal values, here. The Cultural Heritage Lawyer Rick St. Hilaire proposes on September 18 to combat antiquities trafficking by making changes to the US customs form. La Libertie interviewed Cheikmous Ali, founder of Association for the Protection of Syrian Archaeology about the situation for Syria’s heritage here. RTBF ran a documentary on art and looting – Trafic d’arts, le grand marchandage – available here. The documentary is discussed by Arte TV (in French) here. The DG of the DGAM, Maamoun Abdulkarim, is profiled by the Sydney Morning Herald. The BBC asks why heritage matters? Sputnik interviews Dr. Andrew Wilson (Bradford) about 3D modelling as a means to preserve destroyed archaeological sites. The International Scope examines UNESCO’s shortcomings and limitations with the destruction of cultural heritage in Iraq and Syria.